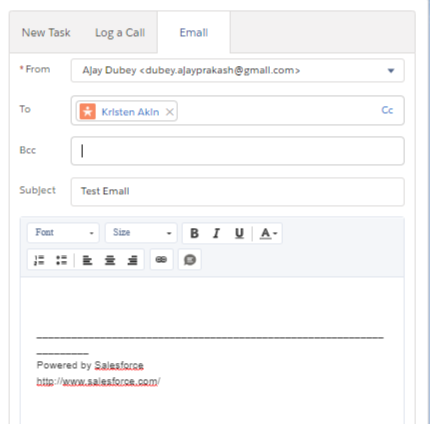 I was going through the salesforce document Daily Allocations for Email Alerts It is mentioned that There’s no limit on sending single emails to contacts, leads, person accounts, and users in your org directly from account, contact, lead, opportunity, case, campaign, or custom object pages. I tried sending email directly from Lead record but it is counting under the daily limit. There’s no limit on sending single emails to contacts, leads, person accounts, and users in your org directly from account, contact, lead, opportunity, case, campaign, or custom object pages. Then the highlighted part is crucially important. There's no limit to a user going to the page and sending an email manually. The limits still counts for Apex sending SingleEmailMessage objects. Intuitively, this makes sense because Apex could sends vast amounts of email and be spamming or using lots of resources. Users manually sending from pages just can't do the volume to cause issues, so SF don't limit it. Ajay came back and showed more detail. Which implies that he's trying this on a scratch org. I've tried on a scratch org, and had the same result as him: sending an email from the object page, even in Classic used up one of my email limit. But, it does not do this in a conventional sandbox. Not the answer you're looking for? Browse other questions tagged email governorlimits limits singleemailmessage or ask your own question. Scheduled Mass Email - When is the Query Run? Winter '17 Apex Email Limits: What counts? How do I stay within governor limits if there is no method which returns the number of Emails sent? which is best approach for custom email alerts, Declarative vs Programmatic?